I just finished reading Bruce MacNab's book The Metamophosis last night. I bought the book from Bruce almost a year ago and it's taken me this long to finish. But the reason it took so long is not because of the content of the book but because of my performing schedule and an eye site issue that was making it harder for me to read for long stretches. But I'm happy to say the book has been read, cover to cover. I have to say this book was an eye opener. Very different from any other Houdini biography I've ever read. This is maybe the first bio of Houdini where he isn't 'the greatest'. In fact, he is a struggling performer during the months in 1896 that are covered in this book. He stumbles upon things that will later be iconic parts of his act in years later, but during these early days they are so new that he is testing the waters to see what works and what doesn't. A great example is an outdoor stunt that he was promoting where he would be tied to a horse and would free himself. The stunt quickly got out of hand when the horse took off running and Houdini could do nothing but hold on for dear life until the animal tired. Eventually, it did and Houdini was able to free himself. Unfortunately, the crowd of spectators also tired and had left before Houdini was free. He learned a huge lesson this day about staying in control of his challenges. The only thing hurt was his pride thankfully. I loved the chapters with Samri Baldwin. I had written a bit about Samri Baldwin recently and was so excited at what I thought was a real 'find'. Then one of my readers pointed at that this info and more was in the Metamorphosis book. Indeed it was and it's great to read. Apparently, Houdini and Baldwin were going to team up on a tour at one point, but sadly it never came to pass. The book does a great job at pointing out what a real grind show business can be. From renting the hall or theatre, to promoting and then waiting to see if your hard work has paid off. Often, things beyond your control come into play to prevent a crowd from attending. Houdini faced more small crowd venues on this Canadian tour than he did large crowds. 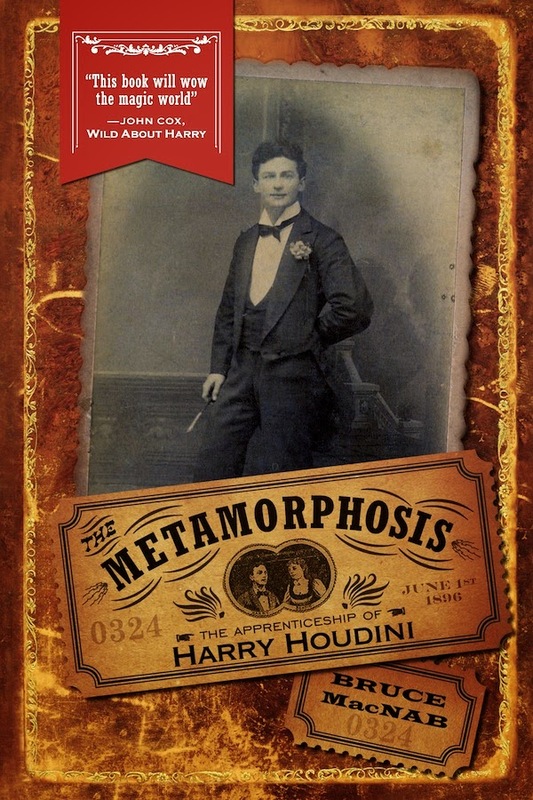 And yet, in three short years Houdini would meet a man who would help Houdini become famous. That man was Martin Beck, who told Houdini to drop the magic and stick to escapes. Yet, during the Canadian run in 1896, Houdini was doing every kind of magic imaginable, even a levitation and mind reading! Along the journey, we get to meet other performers and artists, some famous, some not so well known. It's not often that this much new information comes out on a performer who has already been written about in dozens of biographies. The author Bruce MacNab really did his homework and researched this topic and dug up information that no one else had seen. He even describes situations where he searched and searched for documentation on a particular event but none could be found. My hat goes off to Bruce for such a fine job. I know by now, most of my readers have probably read this book. But if not, please get yourself a copy and enjoy the journey of Houdini and Bess on Tour in Canada in 1896. Wonderfully done! Click the link at the top of the page to order the book from Amazon!